1 Heat the oil in a large saucepan, add the onion, root vegetables and bay leaves, then cook for 10 to 15 minutes, stirring often. 2 Boil the kettle. Measure out 900ml of boiling water in a measuring jug, then add the Knorr Chicken Stock Pot and stir to make a stock. 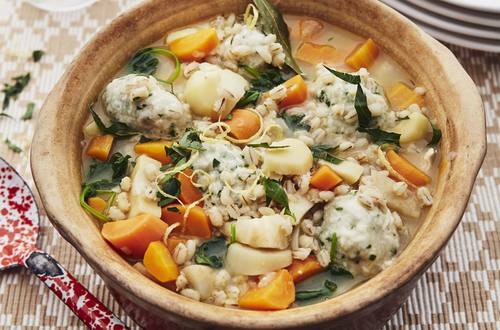 3 Pour it into the pan, add the pearl barley and cook for 35 minutes, or until the grains are tender but still with a bit of ‘bite’. 4 Meanwhile, make the parsley dumplings. Place the flour and salt in a bowl, grate in the butter and rub it in to form breadcrumbs. Stir in the parsley. 5 Pour in 100ml of cold water and bring it together to form a sticky dough. 6 Use a knife to cut the dough into 12 pieces, then roll into balls. 7 Stir the chicken and greens through the stew, topping up with water if needed. Season to taste with black pepper, then plop the dumplings on top. 8 Pop a lid on top, then simmer for 20 minutes, or until the dumplings have puffed up and an inserted skewer comes out clean.